When it comes to Digital Marketing, we all know "Content is king." You could have the best Social Media targeting on the planet, your audience won't budge if you don't give them a reason to stop scrolling. The foundation for great content is knowing your audience. I mean really knowing your audience. This goes beyond a customer persona, we need to develop a deeper understanding to really connect. One powerful yet surprisingly underutilized way to do so is to build an Empathy Map. An Empathy Map is a collaborative tool teams can use to gain a deeper insight into their customers. Much like a user persona, an empathy map can represent a group of users, such as a customer segment. Think & Feel: They want to feel safe in their own home. Hear: The neighbors had a fake delivery man knock on their door last night. See: They have a beautiful home, and two young children. Say & Do: We're away from home a lot, we like to stay active. Just knowing this gives an advertiser valuable input on the content they could create. "We know you value your time with your family, as well as your safety. You can still maintain an active lifestyle while having peace of mind when you hear a knock on the door. With Ring, you can see and respond to whoever is there, even when you're not at home"
This goes a lot further than mentioning all the awards and features associated with Ring. It connects with audience on a more genuine level. Here's another example for IDK Tonight, a website that curates unique experiences for couples in New York City. As the name implies, they help couples figure out what to do for date night. 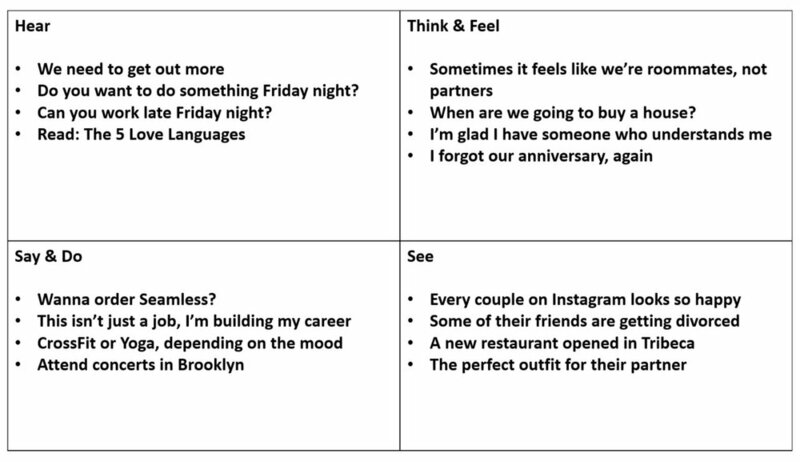 This is an Empathy Map that aligns with their target audience. Now, based on what they know about their audience, here's an example of the content they could create. Remember when going on a date Tuesday night didn’t seem like a recipe for a horrible Wednesday? You know every relationship takes work, but it’s easy to let your career and other commitments get in the way of spending time with your partner. You’re busy enough as it is, that's why we’re here to take the guesswork out of what you should do when you finally have time to go out. IDK Tonight is a couples guide to date nights along with real reviews by real couples. Focus on enjoying time together, not playing another round of “I don’t know, what do you want to do?”. We all know content is important, but the ability to connect is what makes it effective. Empathy Maps are the key. Interested in learning more? Join me for a free webinar October 11th from 3:30-4:30pm EST. We'll walk through how to create an Empathy Map for your customer segments, and how to incorporate them into your content strategy.